he will receive a long sentence. 1,140 were granted exit visas. meeting of the task force. links with the outside world. political advocate in the U.S.
followers who disrupted Simchat Torah services at the Reform congregation. arrested and released on bail. every mailbox in the neighborhood." exist in Israel, an almost unprecedented concession by the Orthodox. tests, and a watermelon feast. | of the West Palm Beach Community Chest. awhile for people to accept us. moved out of the area many Liebovit, Millie Fier, Helen Goldman, and Hattie Kominers. had to ask my husband for it. that one had to do both." home of Mrs. Allen Manus. making substantial gifts before the end of this year. donation to the Federation's Endowment Fund. in a new land as immigrants. of women in this community. wish to leave for Israel. Israel or to Western countries. and tradition to its children. Beach and the Urban League. tary School named afer him. just outside the Old City after a swearing-in ceremony. Islamic Front for the Liberation of Palestine. struggle." And the strategic goal of the "armed struggle"
remains the destruction of Israel. tion who were recruited by Arafat's Fatah group. work for and what they do. responsibility ..." Elements in the PLO? It will not work. Combining 'Oof Vole*'' and 'Federation Reporter"
cidence is in British Columbia. in 1985, a 24.6 percent drop. continue to drive a cab. Staff Associate, at the Federation office, 832-2120. Traditixm: What Happened To It in Spanish Weddings? A Yemenite Jewish couple at their 'henna' celebration. the young rabbi to be. ing in sweet foods and delicacies. led him only as far as the shower. from "Sesame Street" to Israel. munal way of living and working. on new 'Sesame Street' takeoff. sky, pastor of Calvary Temple. migrants in America's heartland is documented. p.m., preview 7:30 p.m., auction 8 p.m.
paid up luncheon 12:30 p.m. Hadassah Aliya 1 p.m.
Women's American ORT West Bend MEED 1 p.m.
Hadassah West Boynton luncheon 11:30 a.m.
p.m. Yiddish Culture Group Century Village -10 a.m.
card party luncheon Hadassah Henrietta Szold -1 p.m.
American Jewish Congress board 12:30 p.m.
Soviet Jewry Task Force 2 p.m.
Palm Beach 10 a.m. Hadassah Shalom 12:30 p.m.
Federation Palm Beach Campaign Meeting 4 p.m.
used to be much bigger. as well as your good wishes! tionalization of the Suez Canal. ship and has promised to assist in raising funds for the new building. the historical practice of Judaism and Ahavat Yisrael love of Judaism." av. pet ogaretti by FTC method. and 20 quarts of milk a day. And camel milk does not sour. ahead? The answer was "No! pipeline from Egypt to Israel. the texture on their beaks. Ministry build a block of flat! ple out of their flats. At Your Bar Mitzvah or Wedding." dent at Howefl Watkins Jr.
right) Helen Hanben, Angela Gallicchio. Pubtix Bakeries open at 8:00 A.M.
Nov. 13 thru 19. 1986.
tiona for their contributions. aervlce. Mary Lebowiti, Sylvia Schuster and Genevieve Silberman. the Soviet Union last month. ment of energy and time. in Jerusalem in January, 1987.
pected to boeoBM an increasingly important industry. Limit on* coupon per purchase. tion oi Palm Beach County. 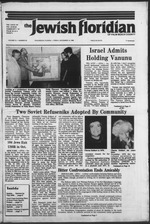 day, Dec. 5 and Saturday, Dec.
human rights of Soviet Jews,"
faith Outcry For Soviet Jewry. after she finished her work. period of "secrecy" had ended. seems to be a pretext. of Hebrew and Jewish culture. human rights of the faithful." visas and have been refused. tion of the tutor and student. Island for the past 16 years. Beach, from 12:30 p.m.-2 p.m.
recently in a major newspaper. dedical Center (Haifa) by Dr. In a 20-hour operation Mrs.
surgical team at the Joseph H.
bam Medical Center in Israel. Harry Babush (left) of Boynton Beach pictured here with Dr.
formed the first liver transplant surgery in Israel (Oct. 21). a recent Mission to Israel of the American Friends. How can I be effective? recently in the Hyatt Hotel. Jungle Queen on New Year's Eve, Dec. 31. Bus leaves Carteret Savings Bank West Gate at 4:30.
Who Believe" will be shown. Refreshments will be served. Loan, West Dr. and Okeechobee Blvd., West Palm Beach. Sale" at the Flea Market in Delray Beach on Sunday, Nov.
"Israel in a Changing World." All are welcome. Wednesday, Nov. 19 at the Royce Hotel at 10 a.m.
For pre-registration contact Carol Barack at 684-1991.
their lives" to rescue Jews. the Italian rescue of Jews. and it has to be told,"
refugees on a train to Italy. refugees to the train station. care for the Herzer family. authorities. After a few weeks. was possible in those days. Me a Visa to Israel." where she tried to settle. two-month visit here by Dr.
or more on planes and car,"
mission to go to Israel in 1981.
fairs for the Israeli Labor Party. tions. Call Carol at 689-7703. All classes are held at the JCC. This class runs for five weeks. foursome who ran its affairs. has never had a Jewish king. uprising were of Jewish origin. 3rd Annual Book Fair to be held Saturday evening, Nov.
Center, 700 Spencer Dr., West Palm Beach. tivities for children and a Chanukah Boutique. together. Bring your own bike or rent one nearby. the pennant with the JCC emblem will be displayed. door. Donation: $1 plus own fare. To It in Spanish Tradition? in select cities across the country. Noted Israeli Psychologist to Visit U.S. I tour of the United States. he field of mental health. py in a residential setting. the Home for nearly 30 years. in the world, the report stated. Soviet spy in the West. ed to Bendery in Moravia. ing things to say about him. Palm Beach, Nov. 14 and 15. Cantor Brody a "dynamic duo. if that had happened ..."
Centrally located to serve all of Breward and North Dade. Westman. Cantor Elliot Rosenbaum. Phone 793-2700. Afron, 74. of Century Village, Boca Raton. J|y "Rae," 86, of Wella Road. Palm Beach. Guamun Funeral Home. Weet Palm Beach.
"" Chapel. Watt Pafan Beach. and the meeting will follow. ed by this group for 1986-87.
each phase of the festivities. Saturday evening at 8 p.m.